A pill to help you forget? Drug-induced forgetting is a form of memory loss resulting from pharmacological effects and can be regarded as detrimental or beneficial, depending on the intended use of the drug. 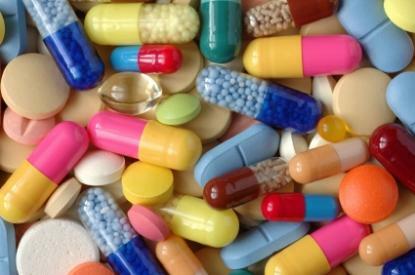 Many medications are engineered to treat illnesses unrelated to memory, but contain forgetting as a negative side effect. Conversely, for patients undergoing major medical procedures and others who suffer from drug addiction or posttraumatic stress disorder (PTSD), drug-induced forgetting may be regarded as therapeutic. PTSD is an anxiety disorder that affects people worldwide; the potential to erase or weaken the traumatic memory underlying a patient’s diagnosis has powerful implications. Although it is not yet possible to completely erase traumatic memories in humans, it has been successfully modeled in rodents using drugs that manipulate epigenetic changes, protein synthesis inhibitors, and glucocorticoid receptor antagonists. In attempts to erase memories, a common method is to target the labile period that occurs after recall. During this time period, the previously stable memory is subject to disruption, updating or erasure. The brain has a powerful capacity to remember- it can remember events, facts and patterns that were learned several years ago. One of the mechanisms that underlie the brain’s ability to remember is consolidation. Consolidation facilitates the stabilization of select new memories to ultimately form long-term memories. Memories are believed to be stored within chemical synapses, the link between neurons that facilitate communication within the nervous system. Such synapses are plastic and can therefore be weakened or strengthened following learning and consolidation. There are two forms of consolidation, synaptic consolidation and systems consolidation. The underlying mechanisms of synaptic consolidation are thought to be dependent on long term potentiation (LTP) involving protein synthesis. LTP is an activity dependent form of synaptic plasticity and is characterized by a sustained increase in synaptic response following stimulation; it is considered widely as the cellular mechanism that underlies learning and memory . LTP occurs in both an early and late phase; the early phase persists for approximately 60 minutes and is differentiated by the longer late phase, which is dependent on protein synthesis . The molecular mechanisms and structural changes in late phase LTP allow for the stabilization of synapses following learning. Experimental induction of LTP through tetanic stimulation results in the transcription of immediate early genes (IEGs), such as zif268, c-fos and Arc during late phase LTP . Following a learning task, Arc knockout mice show impairments in long-term memory formation and exhibit only the early phase LTP. The results from this study, in addition to others, suggest that IEG expression is critical for synaptic consolidation and the stabilization of memories into long-term storage . Systems consolidation is a lengthened process involving the reorganization of memories and is characterized by the transfer of memories from the hippocampus into the neocortex. The Standard Consolidation Theory (SCT) suggests that when memories are initially formed, they are located within the hippocampus; therefore, retrieval of these memories is hippocampus- dependent. However, through systems consolidation, these memories are later transferred into the neocortex where they can be retrieved independently of the hippocampus . These memories are more stable, and considered as long-term, remote memories. Experiments involving the disruption of the hippocampus in a variety of behavioral models of learning, have provided evidence to support the SCT [9-11]. Lesions of the hippocampus through pharmacological intervention, aspiration, or genetic methods, result in retrograde amnesia that is temporally graded. This suggests that recent memories, which are associated with the hippocampus, are more susceptible to interference resulting from hippocampal lesions, than remote long-term memories, which have been consolidated to the neocortex. Although systems consolidation allows memories to remain stable over long periods of time, they can return to an unstable, labile state following memory recall . During this period, memories may either be further strengthened or weakened . The strengthening of memories is due to a process known as reconsolidation, which also allows for memory updating or integration . Similar to consolidation, which facilitates the stabilization of memories after acquisition, reconsolidation is also dependent on protein synthesis . Similarly, interruption during reconsolidation will inhibit memory stabilization, which can lead to forgetting or weakened connections . One method of interrupting reconsolidation is through the use of protein synthesis inhibitors. As protein synthesis is required for reconsolidation, its blockade by means of pharmacological intervention should disrupt the stabilization of memories following recall. Nader et al., provided evidence for this and showed that stabile, consolidated fear memories could be forgotten following the infusion of anisomycin after memory reactivation. However, application of the drug six hours following memory retrieval did not affect the memory, suggesting that reconsolidation occurs within a particular duration of time. This further suggests that following reconsolidation, memories remain stabilized; the inhibition of protein synthesis during this time will not result in further disruption or specific erasure . Similar weakening was observed with administration of cycloheximide after retrieval in a conditioned taste aversion (CTA) learning paradigm . Post-Traumatic Stress Disorder (PTSD) is a psychiatric disorder that typically develops following a traumatic event. Typically, it results from the development and maintenance of an aversive association to a stimulus that was previously neutral . Patients with PTSD will display three classes of symptoms; they will experience recurring negative thoughts associated with the traumatic event, social avoidance and lastly, they will show heightened physiological responses to stimuli similar to the traumatic event . When these symptoms persist for over 3 months, patients are diagnosed as having a chronic form of PTSD, whereas acute forms endure for less than 3 months . PTSD affects about 5-10% of the population and appears to be more prevalent among females, as they are affected twice as often than males . Although there are currently some available treatments for PTSD patients, they are not very effective. Due to its classification among other fear-related psychiatric disorders, common pharmacological interventions for PTSD involve the use of antidepressants or benzodiazepines. However, these drugs are not necessarily specific in their pharmacological actions within the brain and may not be effective for all patients . Current research to better understand the psychiatric disorder has involved the use of fear conditioning learning paradigms in generating fear responses in rodent model systems. Other research has attempted to investigate the how formation of these fear memories can be inhibited by disrupting consolidation following acquisition with drugs such as opioids  . However, it has been suggested that preventing memory formation of an entire event may be unethical in humans and may pose as a potential safety hazard . A more ethical option involves the use of extinction to decrease fear response by way of pharmalogical intervention. Other research has provided evidence to support that traumatic memories can be targeted during retrieval, a process that causes the memories to become unstable and subject to disruption . Therefore, there is evidence to support a treatment strategy involving both memory retrieval and pharmacological drug intervention. Given the wide range of symptoms experienced by patients with PTSD, it has been difficult for researchers to develop an animal model that displays both the neurological and behavioral symptoms concurrently. In addition, it is important to consider that many common symptoms such as intrusive thoughts, nightmares and flashbacks, cannot be assessed using animal models. However, because these symptoms are not all required for a diagnosis of PTSD, the inability to study them may not necessarily be so limiting . Various models PTSD have involved manipulations of the neuroendocrine system  and the excitability of the neural fear circuits of the brain . However, as PTSD is characterized by the formation of a strong aversive association, models involving fear conditioning are more commonly used to further understand the disorder. In a fear conditioning learning paradigm, mice learn to predict an aversive event in response to a given stimulus . This response results from a learned association between an aversive unconditioned stimulus, such as a foot shock or loud sound, and a neutral, conditioned stimulus. The natural fear response can be easily observed and measured behaviorally as freezing, increased heart rate, blood pressure and respiration rate . As fear learning involves both memory and emotions, brain structures such as the amygdala and hippocampus are important in mediating the response. While the amygdala is important in the formation of fear memories and associations, the hippocampus provides the contextual information to form this association . In addition, the hippocampus is also active during fear memory retrieval resulting from contextual cues . (HATs), whereas their removal requires the action of histone deacetylases (HDACs). as methods to disrupt or overwrite fear memories in the treatment for PTSD. Within the field of neurobiology, epigenetics commonly refers to the study of how molecular processes, such as chromatin remodeling or histone modifications can regulate gene expression. All cells within the human body are composed from the same genetic information; however, not all cells are the same. The ability for a neuron to remain differentiated from a cardiac cell can be attributed to epigenetic modifications, which regulate gene expression . Within the nucleus, DNA is wrapped tightly around histones, allowing them to exist in a tightly condensed form. Epigenetic tagging, such as acetylation, ubiquitination, phosphorylation or methylation, occurs post-translationally at the N-terminus of these histones. Histones are acetylated by histone acetyltransferases (HATs) on positively charged lysine residues, causing them to become neutralized . It has been suggested that the removal of this charge causes histones to bind to DNA with reduced affinity, which facilitates the binding of transcription factors to the DNA . Thus, histone acetylation can enhance gene transcription reversibly. The removal of acetyl groups from histones is performed by histone deacetylases (HDACs) . Conversely, methylation results in an increased affinity of the histones to DNA because methyl groups are basic and hydrophobic. Thus, histone methylation results in epigenetic silencing . Lastly, the DNA sequence can be methylated as well. DNA methyltransferases (DNMTs) are enzymes involved in the addition of methyl groups to cytosine residues located on DNA. Similarly to histone methylation, DNA methylation is also typically associated with decreased gene transcription . 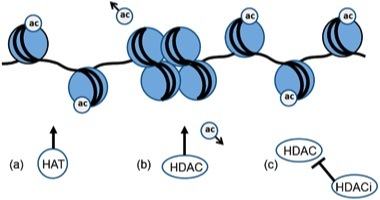 Histone acetyltransferases (HATs) are involved in the acetylation of histones, which allows transcription factors to better access and bind to DNA. It has been suggested that the inhibition of HATs may serve as a treatment for PTSD. A recent study investigated the use of garcinol, a natural HAT inhibitor from the Kokum tree fruit. In an experimental rat model of PTSD involving auditory fear conditioning, garcinol disrupted both consolidation and reconsolidation when it was either locally infused into the amygdala or administered systemically, following fear memory formation and retrieval. The disruption was attributed to decreased levels of histone H3 acetylation within the LA. 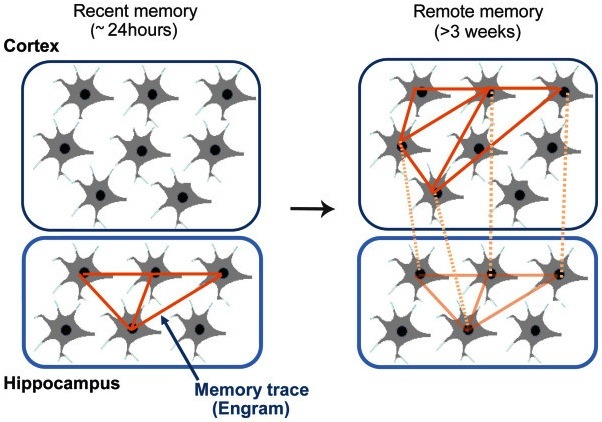 However, the administration of garcinol was only effective during a given time window following training (within six hours) or memory retrieval (within one hour), suggesting it is targeting memories when they are unstable and labile. In addition, garcinol showed to be effective in disrupting both recent (24 hours old) and remote (two weeks old) memories . It is known that p300, a HAT, is involved in regulating gene expression important in hippocampal-dependent memory formation. However, the formation of fear extinction memories is not dependent on the hippocampus, but rather the infralimibic region of the medial prefrontal cortex (ILPFC). Until recently, it was not know whether p300 also plays a role in regulating transcription in the ILPFC. To investigate its role, researchers infused a p300 inhibitor into the ILPFC following fear extinction training. Results provided evidence that using a HAT inhibitor, specifically one that inhibits p300 within the ILPFC enhances the formation of fear extinction memories by way of increased synaptic plasticity . The regulation of gene expression through epigenetic modifications, such as acetylation, has shown to be important in learning and memory of animal models. It has been shown that histone H3 acetylation within the CA1 is regulated in various fear conditioning paradigms and that the administration of histone deacetylase inhibitors (HDACi) can improve fear memory formation . the unconditioned stimulus (US), can be used to extinguish fear memories. Other studies have therefore investigated the effects of HDACi treatment in fear memory extinction. Fear extinction involves the reversal of a previously acquired association resulting from new learning. This requires the presentation of the conditioned stimulus, a tone for example, without the unconditioned stimuli (foot-shock) to prevent reinforcement the fear association . As a result of this, spontaneous recovery of the initial fear response may occur because the memory has not actually been erased, only overwritten . In rodent models, HDACi have shown to enhance fear extinction, resulting in increased histone acetylation within the hippocampus and the medial prefrontal cortex (mPFC) , regions of the brain involved in extinction  . It has been suggested that in patients with PTSD, the brain regions involved in extinction are compromised  . In spite of this, evidence suggests exposure-based therapy as the most effective treatment currently available for PTSD . Exposure based therapy involves the presentation of the fear-evoking stimulus in a neutral environment. The goal is to help patients correct the previously perceived, fear-inducing stimulus as safe . As a result of this, much recent research has focused on methods of improving treatment. A current paper by Gräff et al. suggests that in mice, the use of reconsolidation-updating paradigms are unable to overwrite remote fear memories and are only useful for recent memories. They attribute this difference to the lack of increased nitrosylation on HDAC2, resulting in a reduction of HDAC2 binding to the cFos promoter within the hippocampus following remote fear memory recall. cFos is an immediate early gene involved in neuronal plasticity. This suggested that remote memories are less plastic following retrieval than compared to recent memories. However, the administration of an HDACi, Cl-994, which specifically targets HDAC2, in conjunction with extinction training allowed for updating of the fear memory. Cl-994 increased the acetylation of promoter regions of immediate-early genes, such as Arc and cFos, and thereby upregulates their transcription, which is important for neuroplasticity . It is suggested that although this mechanism does not induce forgetting, it does either modify the original fear memory trace or involves re-learning of a new and neutral association. Therefore, as demonstrated in this study, it is important to consider the potential and power of combining psychotherapy and pharmacotherapy for the treatment of PTSD. hormone at the hypothalamus, and a reduction in cortisol from the adrenal cortex. The hypothalamo- pituitary- adrenocortical (HPA) axis is involved in the regulation of glucocorticoid production in response to a stressor. Structures within the limbic system such as the hippocampus, prefrontal cortex (PFC) and the amygdala, which are involved in fear responses and memory formation, also have influence over the HPA axis . Thus, stress and fear memory formation are inherently coupled with one another. It is suggested that in various psychiatric disorders, the HPA axis is altered, resulting in either a heightened or lowered secretion of glucocorticoids. In PTSD, a disorder triggered by a distinctive and traumatic stressor, is actually characterized by decreased basal levels of corticosteroids. This decrease results from an increased sensitivity to the negative feedback mechanism of the HPA axis . Along with its involvement in the formation of fear memories, the amygdala is also important in mediating the effects of stress on the consolidation of memories. Endogenous stress hormones, such as epinephrine  and glucocorticoids can modulate memory consolidation by way of the amygdala . The infusion of a glucocorticoid receptor agonist, RU 28362, into the basolateral amygdala (BLA) after training, enhances the consolidation of memories . Conversely, lesions of the BLA, the use of ß-adrenergic blockers and glucocorticoid receptor antagonists following training, will negatively affect memory formation . The role of both the amygdala and the stress hormones on fear memory formation has been a focus for finding possible treatments for PTSD. In rodent models of PTSD through fear conditioning paradigms, another glucocorticoid receptor antagonist known as RU38486, can be used to disrupt fear memories. This disruption can occur during both consolidation, which follows training, or during reconsolidation. It is suggested that its use during memory reconsolidation may be useful for PTSD patients. Following recall of fear memories in mice, RU38486 was injected into the amygdala to target the labile state accompanied by reconsolidation. Results indicated that RU38486 disrupts the reactivated fear memory specifically and that it is more effective when administered during reconsolidation, when the stress response is reduced, than immediately after training . Similarly, it was found that injection of RU38486 into the hippocampus following fear memory retrieval also impairs reconsolidation . This also suggests the involvement of hippocampal glucocorticoid receptors in fear memories. The experimental evidence supporting the use of RU486 in disrupting fear memories in rodent models has great clinical significance. Traditionally, RU486 is available on the drug market under the name of mifepristone and is used to terminate pregnancies by targeting the progesterone receptor. Mifepristone has also undergone clinical trials for treatment of Cushing’s syndrome, glaucoma and Alzheimer’s disease and has been proposed as possible treatments for obesity, neuropathic pain and diabetes . Recently, a pilot study investigated the therapeutic use of mifepristone in a small patient population with military-related PTSD. Although the study did not focus specifically on the weakening of traumatic memories, using the Clinician Administered PTSD Scale (CAPS) as a measure of treatment effect, mifepristone showed to significantly improve symptoms . However, this study consisted of a small sample size from a limited demographic of patients and therefore, more research must be performed to investigate the therapeutic use of mifepristone in PTSD. 2. Nader, K., Schafe, G. E., & Le Doux, J. E. (2000). Fear memories require protein synthesis in the amygdala for reconsolidation after retrieval. Nature,406(6797), 722-726. 3. Taubenfeld, S. M., Riceberg, J. S., New, A. S., & Alberini, C. M. (2009). Preclinical assessment for selectively disrupting a traumatic memory via postretrieval inhibition of glucocorticoid receptors. BiolPsychiat, 65(3), 249-257. 5. Clopath, C. (2012). Synaptic consolidation: an approach to long-term learning. Cognitive neurodynamics, 6(3), 251-257. 6. Bliss, T. V., & Collingridge, G. L. (1993). A synaptic model of memory: long-term potentiation in the hippocampus. Nature, 361(6407), 31-39. 7. Nguyen, P. V., Abel, T., & Kandel, E. R. (1994). Requirement of a critical period of transcription for induction of a late phase of LTP. Science, 265(5175), 1104-1107. 8. Malenka, R. C., & Bear, M. F. (2004). LTP and LTD: an embarrassment of riches. Neuron, 44(1), 5-21. 9. Plath, N., Ohana, O., Dammermann, B., Errington, M. L., Schmitz, D., Gross, C., … & Kuhl, D. (2006). Arc/Arg3. 1 is essential for the consolidation of synaptic plasticity and memories. Neuron, 52(3), 437-444. 10. Jones, M. W., Errington, M. L., French, P. J., Fine, A., Bliss, T. V. P., Garel, S., … & Davis, S. (2001). A requirement for the immediate early gene Zif268 in the expression of late LTP and long-term memories. NatNeurosci, 4(3), 289-296. 11. Squire, L. R., & Alvarez, P. (1995). Retrograde amnesia and memory consolidation: a neurobiological perspective. Current opinion in neurobiology,5(2), 169-177. 12. Cho, Y. H., Beracochea, D., & Jaffard, R. (1993). Extended temporal gradient for the retrograde and anterograde amnesia produced by ibotenate entorhinal cortex lesions in mice. J Neurosci, 13(4), 1759-1766. 13. Sakaguchi, M., & Hayashi, Y. (2012). Catching the engram: strategies to examine the memory trace. Mol Brain, 5, 32-32. 14. Clark, R. E., Broadbent, N. J., Zola, S. M., & Squire, L. R. (2002). Anterograde amnesia and temporally graded retrograde amnesia for a nonspatial memory task after lesions of hippocampus and subiculum. J Neurosci,22(11), 4663-4669. 15. Kim, J. J., Clark, R. E., & Thompson, R. F. (1995). Hippocampectomy impairs the memory of recently, but not remotely, acquired trace eyeblink conditioned responses. Behav Neurosci, 109(2), 195. 16. Nader, K., Schafe, G. E., & LeDoux, J. E. (2000). Reply—Reconsolidation: The labile nature of consolidation theory. Nat Rev Neurosci, 1(3), 216-219. 17. Suzuki, A., Josselyn, S. A., Frankland, P. W., Masushige, S., Silva, A. J., & Kida, S. (2004). Memory reconsolidation and extinction have distinct temporal and biochemical signatures. J Neurosci, 24(20), 4787-4795. 18. Flavell, C. R., Lambert, E. A., Winters, B. D., & Bredy, T. W. (2013). Mechanisms governing the reactivation-dependent destabilization of memories and their role in extinction. Frontiers in behavioral neuroscience, 7. 19. Flint Jr, R. W., & Marino, C. L. (2007). Cycloheximide impairs reconsolidation of a contextually reactivated memory in a conditioned taste aversion paradigm. Behav Neurosci, 121(2), 433. 20. Parsons, R. G., & Ressler, K. J. (2013). Implications of memory modulation for post-traumatic stress and fear disorders. Nat Neurosci, 16(2), 146-153. 21. Bisson, J. (2010). Post-traumatic stress disorder. Clinical Evidence, 02(1005), 1-62. 22. Kessler, R. C., Sonnega, A., Bromet, E., Hughes, M., & Nelson, C. B. (1995). Posttraumatic stress disorder in the National Comorbidity Survey. Archives of general psychiatry, 52(12), 1048. 23. Good, A. J., & Westbrook, R. F. (1995). Effects of a microinjection of morphine into the amygdala on the acquisition and expression of conditioned fear and hypoalgesia in rats. Behavioral neuroscience, 109(4), 631. 24. McNally, G. P., & Westbrook, R. F. (2003). Opioid receptors regulate the extinction of Pavlovian fear conditioning. Behav Neurosci , 117(6), 1292. 25. Foa, E. B., Zinbarg, R., & Rothbaum, B. O. (1992). Uncontrollability and unpredictability in post-traumatic stress disorder: an animal model. Psychological bulletin, 112(2), 218. 26. Martí, O., García, A., Vellès, A., Harbuz, M. S., & Armario, A. (2001). Evidence that a single exposure to aversive stimuli triggers long‐lasting effects in the hypothalamus‐pituitary‐adrenal axis that consolidate with time. Eur J Neurosci, 13(1), 129-136. 27. Adamec, R. E., Blundell, J., & Collins, A. (2001). Neural plasticity and stress induced changes in defense in the rat. Neuroscience & Biobehavioral Reviews,25(7), 721-744. 28. Adamec, R. E., Blundell, J., & Burton, P. (2005). Neural circuit changes mediating lasting brain and behavioral response to predator stress. Neurosci Biobehav R, 29(8), 1225-1241. 29. Maren, S. (2001). Neurobiology of Pavlovian fear conditioning. Annu Rev Neurosci, 24(1), 897-931. 30. Hitchcock, J. M., & Davis, M. (1991). Efferent pathway of the amygdala involved in conditioned fear as measured with the fear-potentiated startle paradigm. Behav Neurosci, 105(6), 826. 31. Maren, S., & Holt, W. (2000). The hippocampus and contextual memory retrieval in Pavlovian conditioning. Behav Brain Res, 110(1), 97-108. 32. Kilner, J., Corfe, B. M., & Wilkinson, S. J. (2011). Modelling the microtubule: towards a better understanding of short-chain fatty acid molecular pharmacology. Molecular BioSystems, 7(4), 975-983. 33. Levenson, J. M., & Sweatt, J. D. (2005). Epigenetic mechanisms in memory formation. Nat Rev Neurosci, 6(2), 108-118. 34. Lee, D. Y., Hayes, J. J., Pruss, D., & Wolffe, A. P. (1993). A positive role for histone acetylation in transcription factor access to nucleosomal DNA. Cell,72(1), 73-84. 35. Rice, J. C., & Allis, C. D. (2001). Histone methylation versus histone acetylation: new insights into epigenetic regulation. Curr Opin Cell Biol, 13(3), 263-273. 37. Maddox, S. A., Watts, C. S., Doyère, V., & Schafe, G. E. (2013). A naturally-occurring histone acetyltransferase inhibitor derived from Garcinia indica impairs newly acquired and reactivated fear memories. PloS one, 8(1), e54463. 38. Marek, R., Coelho, C. M., Sullivan, R. K., Baker-Andresen, D., Li, X., Ratnu, V., … & Bredy, T. W. (2011). Paradoxical enhancement of fear extinction memory and synaptic plasticity by inhibition of the histone acetyltransferase p300. J Neurosci, 31(20), 7486-7491. 39. Zovkic, I. B., & Sweatt, J. D. (2013). Epigenetic mechanisms in learned fear: implications for PTSD. Neuropsychopharmacology, 38(1), 77-93. 41. Quirk, G. J. (2002). Memory for extinction of conditioned fear is long-lasting and persists following spontaneous recovery. Learn Memory, 9(6), 402-407. 42. Bredy, T. W., Wu, H., Crego, C., Zellhoefer, J., Sun, Y. E., & Barad, M. (2007). Histone modifications around individual BDNF gene promoters in prefrontal cortex are associated with extinction of conditioned fear. Learn Memory, 14(4), 268-276. 43. Quirk, G. J., Garcia, R., & González-Lima, F. (2006). Prefrontal mechanisms in extinction of conditioned fear. Biological psychiatry, 60(4), 337-343. 44. Milad, M. R., Quinn, B. T., Pitman, R. K., Orr, S. P., Fischl, B., & Rauch, S. L. (2005). Thickness of ventromedial prefrontal cortex in humans is correlated with extinction memory. Proceedings of the National Academy of Sciences of the United States of America, 102(30), 10706-10711. 45. Cukor, J., Olden, M., Lee, F., & Difede, J. (2010). Evidence‐based treatments for PTSD, new directions, and special challenges. Annals of the New York Academy of Sciences, 1208(1), 82-89. 46. Foa, E. B., & Kozak, M. J. (1986). Emotional processing of fear: exposure to corrective information. Psychological bulletin, 99(1), 20. 47. Feldman, S., Conforti, N., & Weidenfeld, J. (1995). Limbic pathways and hypothalamic neurotransmitters mediating adrenocortical responses to neural stimuli. Neurosci Biobehav R, 19(2), 235-240. 48. Yehuda, R., Giller, E. L., Southwick, S. M., Lowy, M. T., & Mason, J. W. (1991). 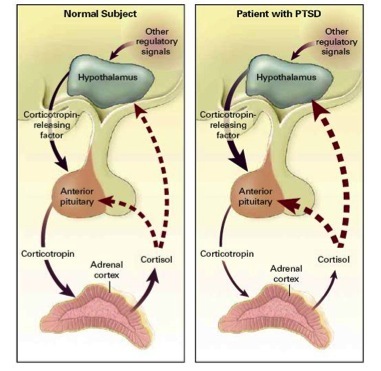 Hypothalamic-pituitary-adrenal dysfunction in posttraumatic stress disorder. Biol Psychiat, 30(10), 1031-1048. 49. Yehuda, R. (2002). Post-traumatic stress disorder. New Engl J Med, 346(2), 108-114. 50. Liang, K. C., McGaugh, J. L., & Yao, H. Y. (1990). Involvement of amygdala pathways in the influence of post-training intra-amygdala norepinephrine and peripheral epinephrine on memory storage. Brain Res, 508(2), 225-233. 51. Roozendaal, B., & McGaugh, J. L. (1996). Amygdaloid nuclei lesions differentially affect glucocorticoid-induced memory enhancement in an inhibitory avoidance task. Neurobiology of learning and memory, 65(1), 1-8. 52. Roozendaal, B., & McGaugh, J. L. (1997). Glucocorticoid receptor agonist and antagonist administration into the basolateral but not central amygdala modulates memory storage. Neurobiol Learn Mem, 67(2), 176-179. 53. McGaugh, J. L., Introini-Collison, I. B., Cahill, L., Kim, M., & Liang, K. C. (1992). Involvement of the amygdala in neuromodulatory influences on memory storage. 54. Nikzad, S., Vafaei, A. A., Rashidy-Pour, A., & Haghighi, S. (2011). Systemic and intrahippocampal administrations of the glucocorticoid receptor antagonist RU38486 impairs fear memory reconsolidation in rats. Stress, 14(4), 459-464. 55. Clark, R. D. (2008). Glucocorticoid receptor antagonists. Curr Top Med Chem, 8(9), 813-838. 56. Golier, J. A., Caramanica, K., DeMaria, R., & Yehuda, R. (2012). A pilot study of mifepristone in combat-related PTSD. Depression research and treatment ,2012. Excellent job, Victoria! Effective use of diagrams and figures and very succinct in your writing. Concise and thorough understanding of the concepts and you explained them well. This is definitely an interesting topic which has been explained very well. I've never seen the Kokum tree fruit before, but the effects on fear extinction seem pretty cool. 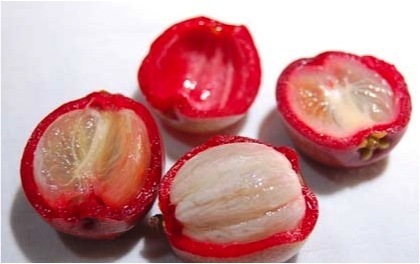 Is this a fruit commonly eaten by people, has this effect been studied in humans? Great organization and excellent headings and captions for your figures. PTSD perspective gives a very interesting insight. It would have been nice to hear the explanations in context of drug addition as well! Very interesting topic, loved the studies you used (especially the Kokum tree fruit study)! Well-researched, clear explanations, and I really liked the sections on epigenetics - wonderful!